This Halloween, join Mickey and his friends at the Magic Kingdom for 36 nights of "not so scary" fun at Mickey's Not-So-Scary Halloween Party. 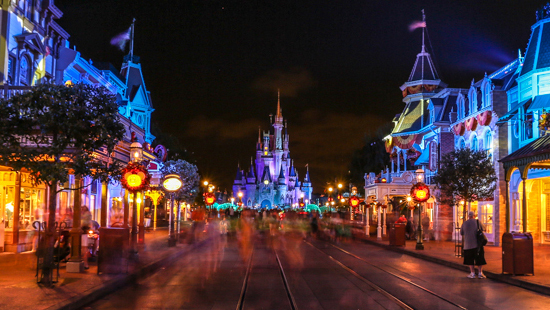 The Magic Kingdom is transformed into a kid-friendly "Spooky" Party. This event requires a separate ticket for all guests ages 3 and up; pricing for 2018 is listed below. PHOTO TOUR of 2018 Halloween Decorations on Main Street, U.S.A. There will be special Halloween fireworks and a specially themed parade starring your favorite Disney characters all decked out in their Halloween costumes! Both of these entertainment events are not-to-be-missed! Tickets can be ordered by calling (407) W-DISNEY or through your Dreams Unlimited Travel Specialist as part of your package/room reservation. 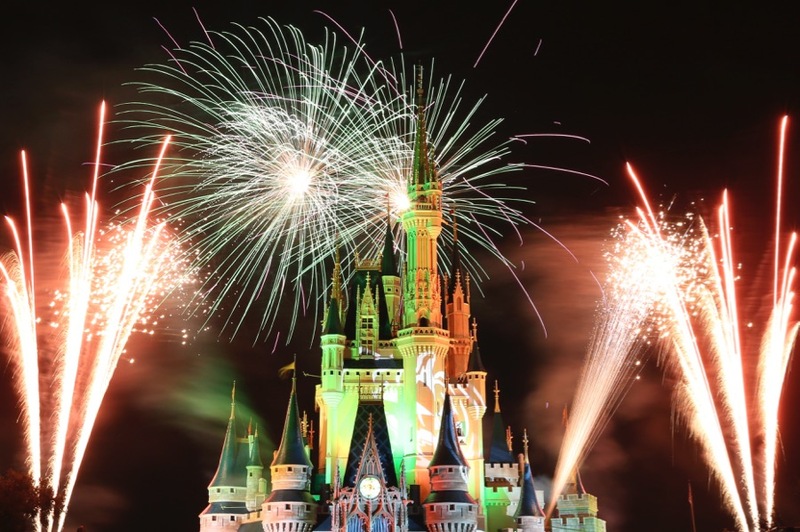 Tickets can be ordered online, by calling (407) W-DISNEY, or through your Dreams Unlimited Travel Specialist as part of your package/room reservation. Come see your favorite characters dressed up in their Halloween costumes! The floats feature Disney Villains as well as your beloved Disney friends. The parade begins with an entrance from the Headless Horseman who slowly trots through the parade route. 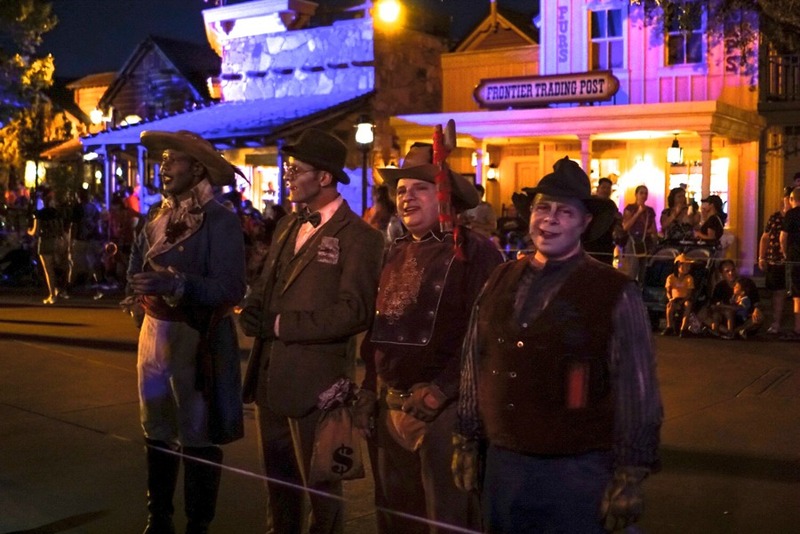 Mickey’s Boo-to-You Halloween Parade features event-exclusive characters, such as Dr. Facilier, Captain Barbosa, Oogie Boogie, the three hyenas from The Lion King – Shenzi, Banzai, and Ed – plus the three Hitchhiking Ghosts from The Haunted Mansion - The Haunted Mansion float is incredible! 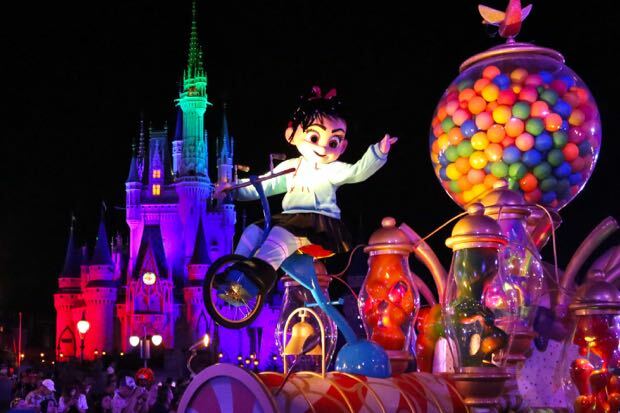 Ralph and Vanellope von Schweetz from Wreck-It Ralph bring in the candy in the grand finale. This parade is not-to-be-missed! A few new additions to the parade for 2018 include an adorable new dress for Clarabelle Cow, Rapunzel (with Pascal) and Flynn Rider (with a Maximus mask) joined in on the opening sequence. Captain Jack Sparrow, and Barbossa were on the ship that was formerly comandeered by the Peter Pan crew. There is also a Tinker Bell float and she's at the top of the treasure chest with the rest of the Peter Pan gang walking. Tip: The second parade is often much less crowded. 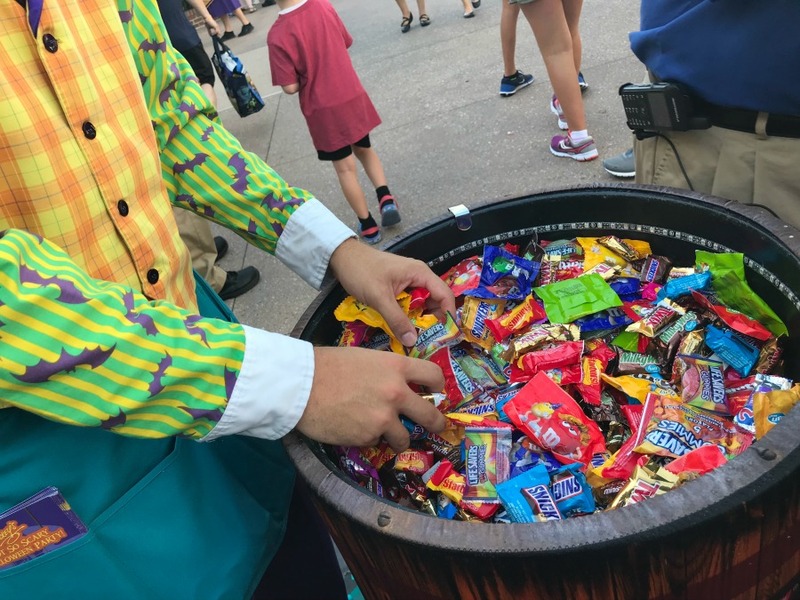 More than 250 tons of candy, including 40 different kinds of brand-name candies, will be handed out to party guests at 14 treat locations across the park. 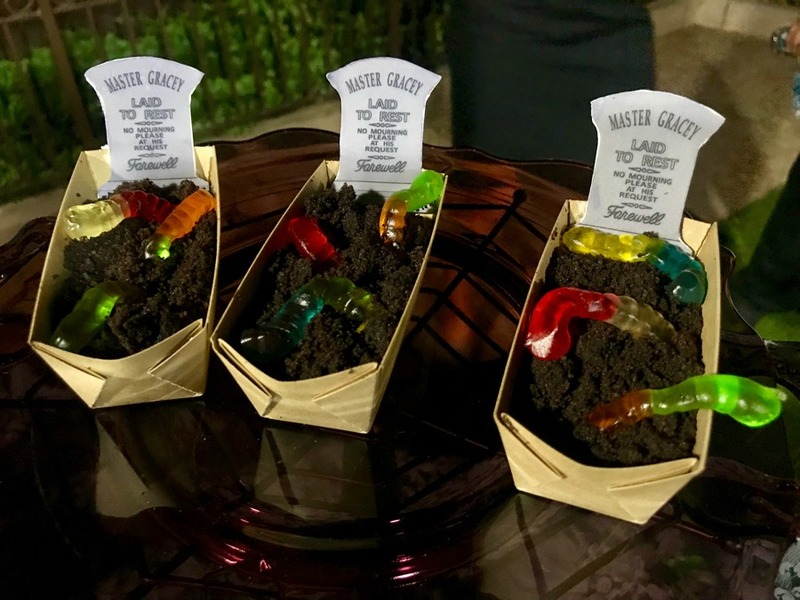 Guests are given trick-or-treat bags to be used at the candy stations found throughout the Magic Kingdom. Locations are indicated on the park map. Some Cast Members will give more than others, but there's no limit to how many times you can go back to the same location for more. 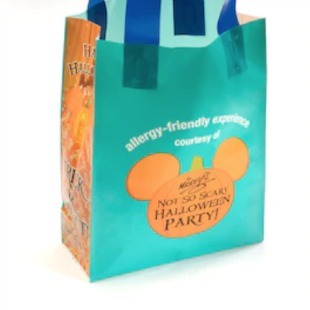 Guests with food allergies can get a special teal treat bag that will designate them as having an allergy (teal is the color that represents food allergy awareness). These bags can be picked up at any of the trick-or-treat locations as well as at the allergy-friendly centers located at the Liberty Square Ticket Office and the Town Square Theater. 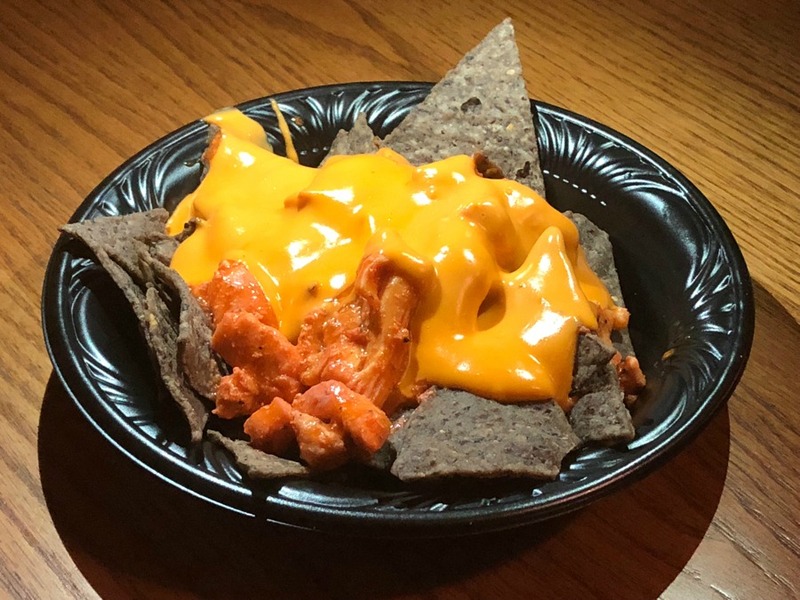 When you trick-or-treat with your teal bag, Cast Members will give you a teal token at each treat station. Later on, you can redeem your teal tokens at the allergy-friendly centers to receive your special treats! This party in the sky is one of the best fireworks shows that Disney offers throughout the year. The Haunted Mansion's Ghost Host welcomes guests to the show where the Disney Villains fill the sky with fireworks and remixes of their theme songs. It's definitely a not-to-be-missed spectacular! 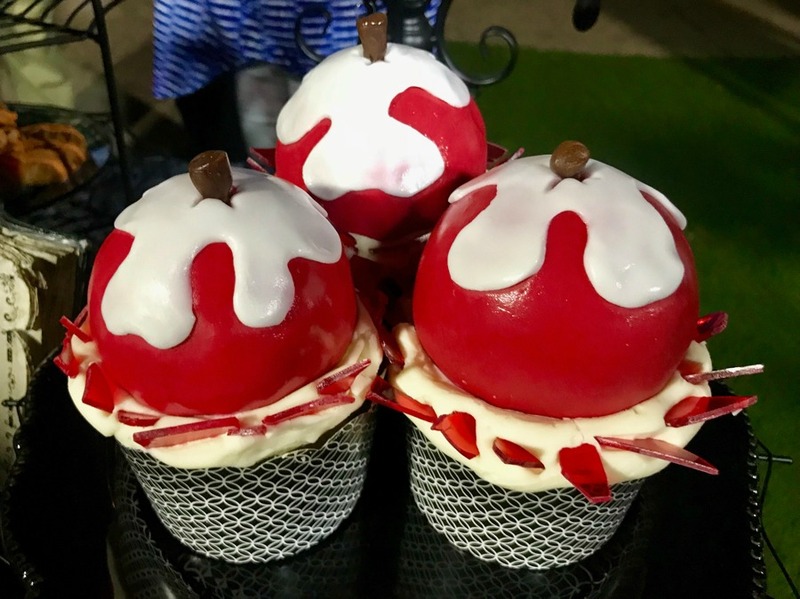 This package includes an all-you-care-to-enjoy dessert buffet at Tomorrowland Terrace Restaurant and viewing for the Halloween Fireworks Spectacular with viewing from the Terrace with reserved seating. 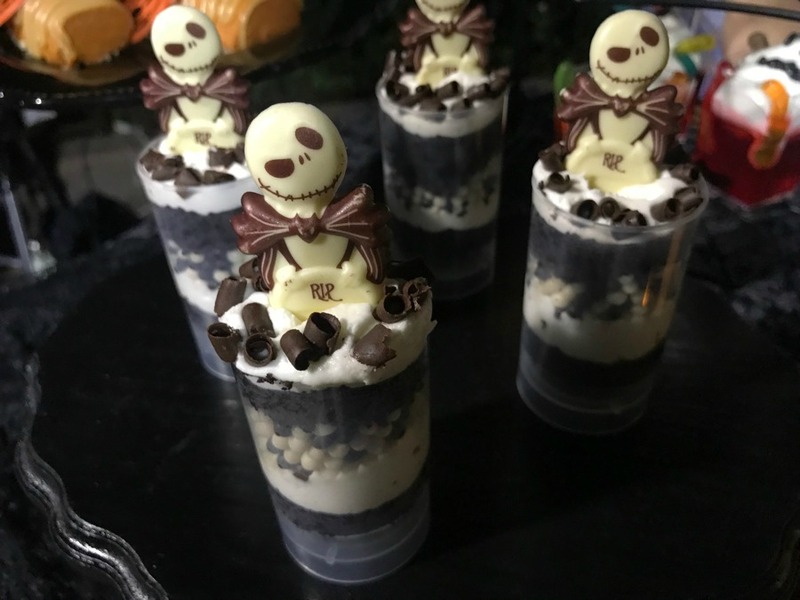 Desserts will include a delicious assortment of sweets with items such as chocolate-dipped strawberries, chocolate mousse, cupcakes, ice cream, seasonal fruits, cheeses, and other ghoulish goodies that will be created daily. Specialty drinks, signature lemonades, coffee, tea, and hot chocolate will also be served. Price is $84 per adult (ages 10 and up); $50 per child (ages 3-9) including tax for the Tomorrowland Terrace viewing of the fireworks. 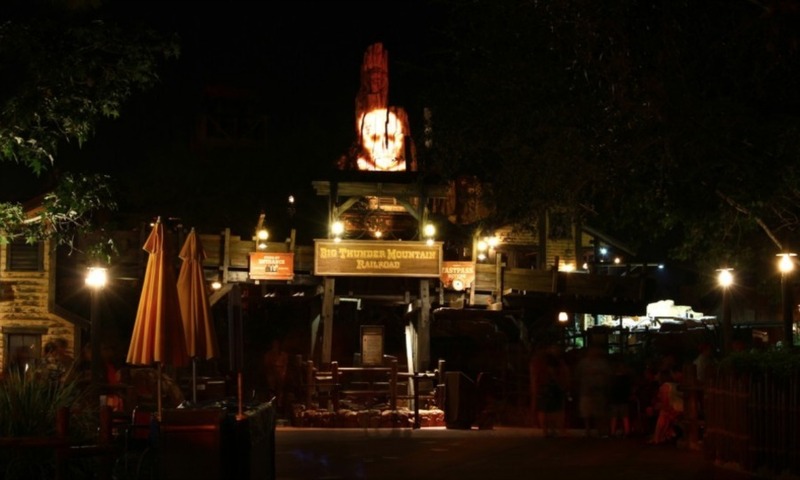 Reservations can be made by calling (407) WDW-DINE or online by clicking here. 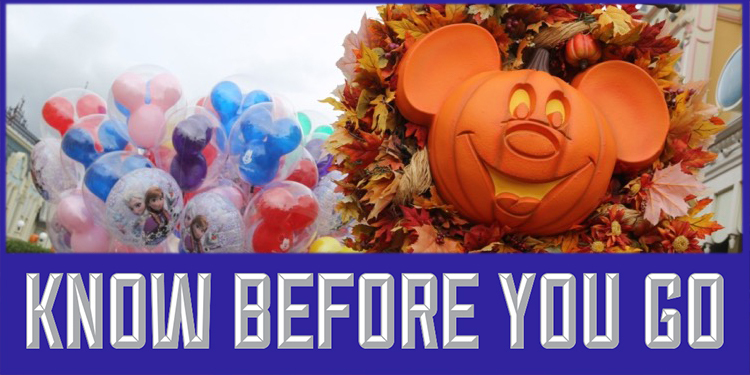 Admission to Mickey's Not-So-Scary Halloween Party is required and not included in the package price. 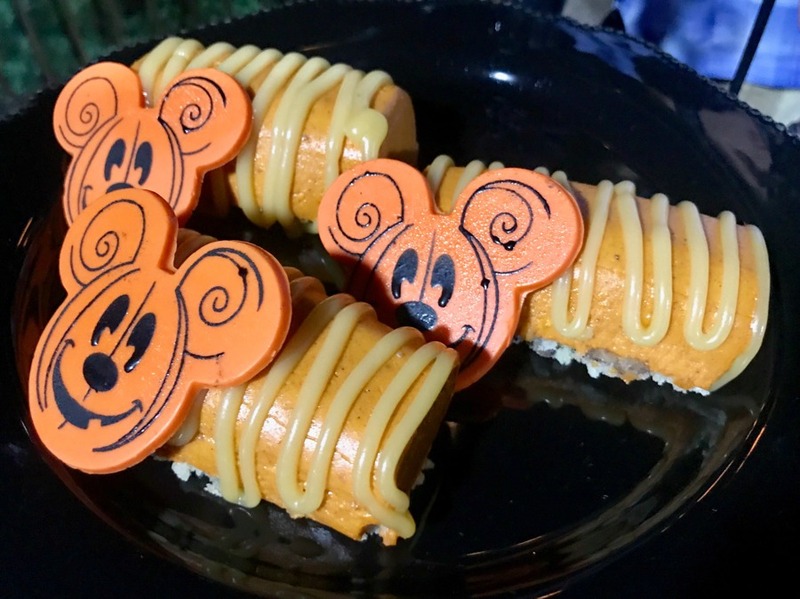 IMPORTANT: In order to make dining or dessert party reservations that take place during Mickey’s Not-So-Scary Halloween Party, you must have a valid event ticket for that night - no exceptions will be made. Dance the night away with your favorite Disney characters! 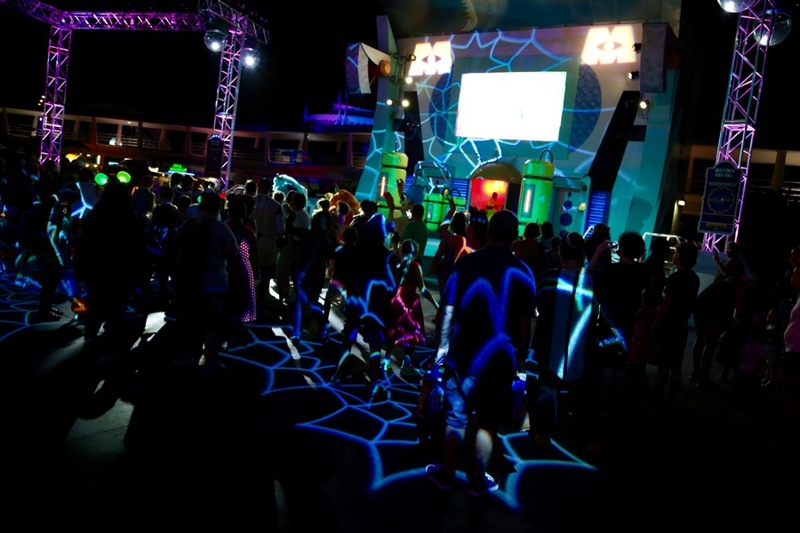 Monstrous Scream-O-Ween Ball at the Rockettower Plaza Stage in Tomorrowland. New for 2018! Storybook Circus Disney Junior Jam - a dance party featuring some favorite Disney Junior Characters, including Doc McStuffins, Vampirina, and Timon from The Lion Guard will take place in Storybook Circus. 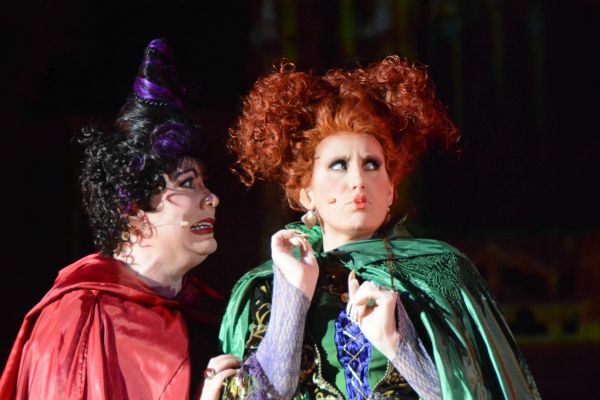 The Sanderson Sisters (Winifred, Mary and Sarah) from Disney's film Hocus Pocus, return to the mortal world each Halloween season for one night. 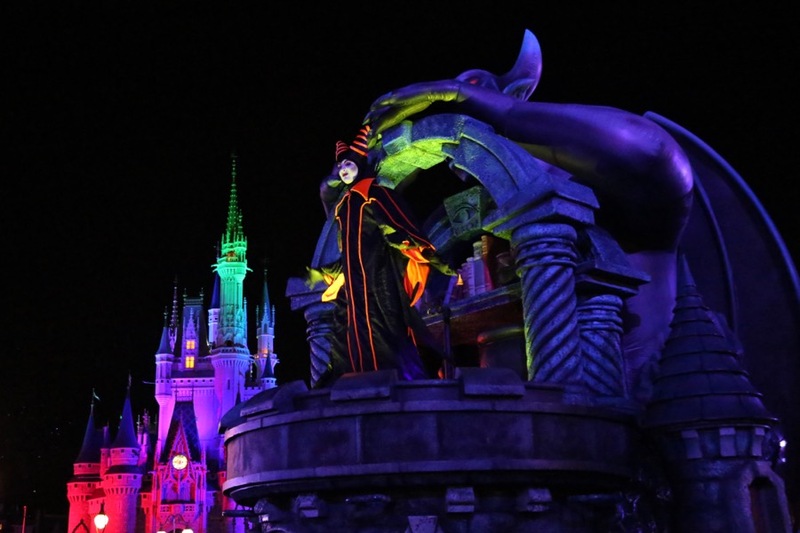 The three sisters take over the Magic Kingdom to throw the "best, evil Halloween party this side of the graveyard." 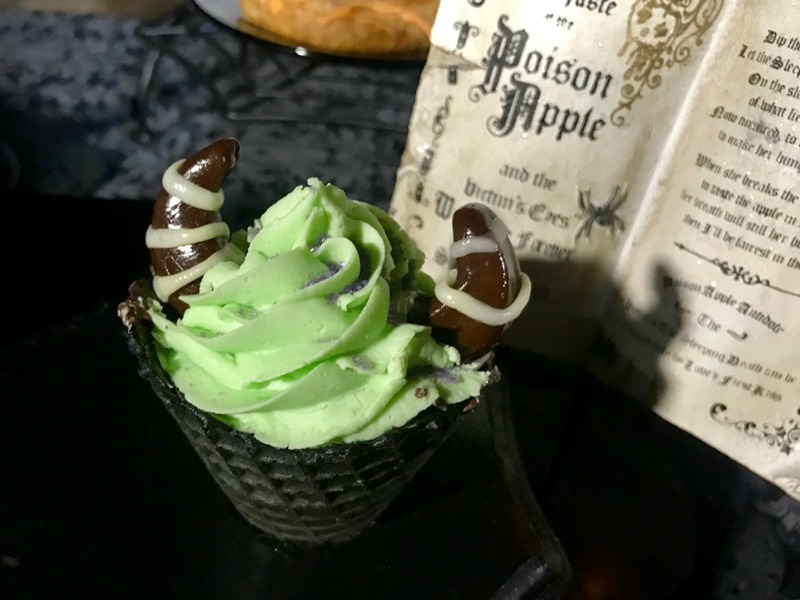 Dr. Facilier, Oogie Boogie, Maleficent, and other great Disney villains help the sisters create the Hocus Pocus Party Potion to cast a spell on all the partygoers. Additionally, the show will feature dancers, projections, and other special effects. Performance times are: 8:30 p.m., 10:45 p.m., and 12:00 a.m. 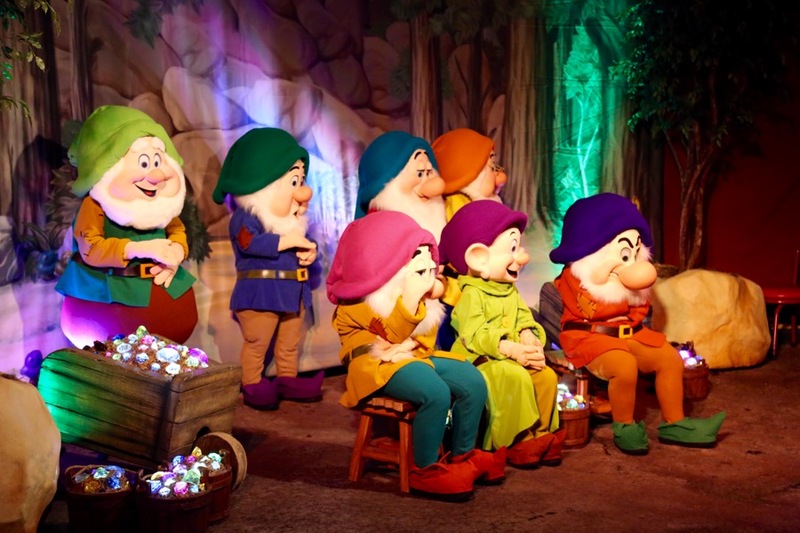 Performance times are: 7:00, 7:45, 8:30, 9:50, and 10:30 p.m.
Party guests will be able to meet characters all around the park up until 11:30 p.m. You'll even have a special opportunity to meet ALL seven dwarfs in Fantasyland! *Guests, especially children, are invited to wear costumes. However, guests are asked to choose costumes that are not obstructive to the child's view or that may be offensive to other park guests. Tip: Characters are in their Halloween costumes, so be sure to wear yours! 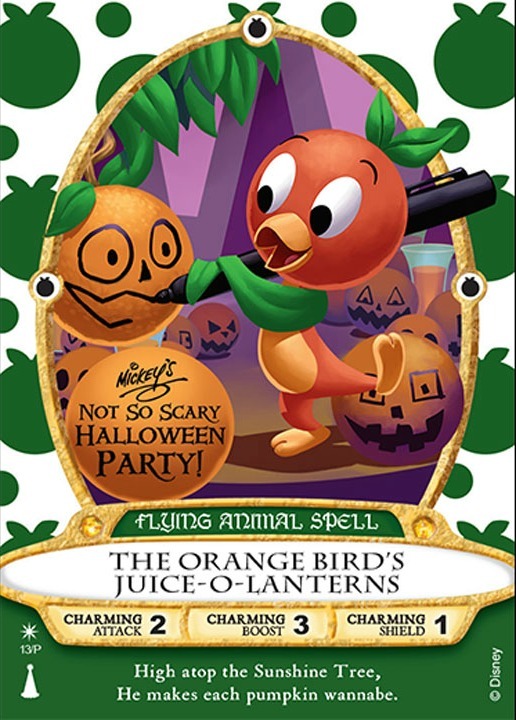 The photo above is of “Orange Bird’s Juice-o-Lanterns” spell card that will be available exclusively to guests attending the 2018 Mickey's Not-So-Scary Halloween Party. Guests must show their party ticket and event wristband to receive their card. Regular card packs will also be available to pick up during the event. Sorcerers of the Magic Kingdom - Don't forget to pick up your event-exclusive spell card! Note: All attractions and experiences are subject to change without notice. 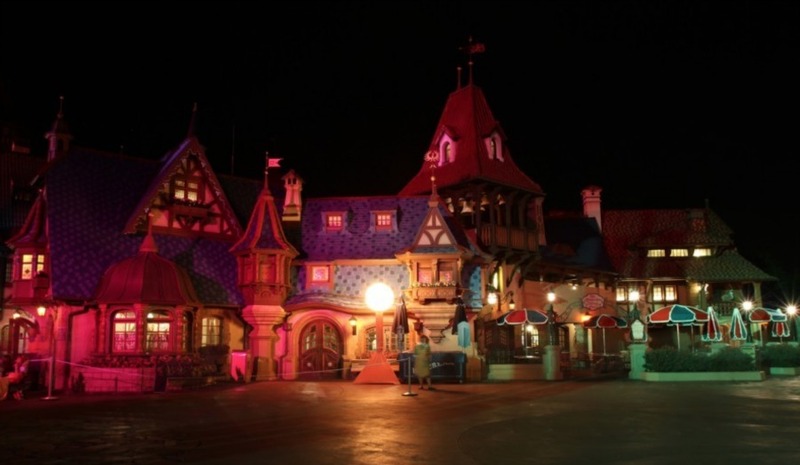 Fantasyland - the Mad Tea Party will take guests for a colorful ride as new lighting and special effects will give a new spin on the night. The color of your costume can make you transform under the new dancing lights. Tomorrowland - Guests riding Space Mountain will be treated to a new soundtrack and special effects as the adventure transforms. 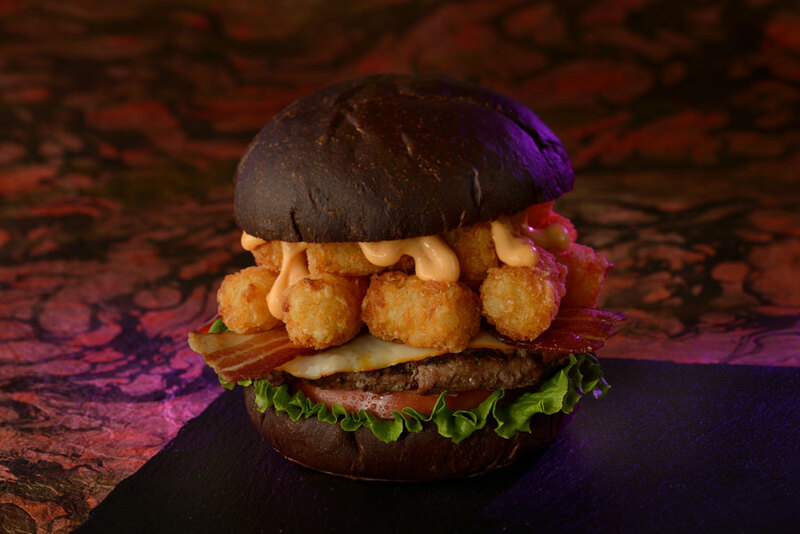 *Table Service dining reservations can be made by visiting the Mickey’s Not-So-Scary Halloween Party Dining page on Disney's site or by calling (407) WDW-DINE. 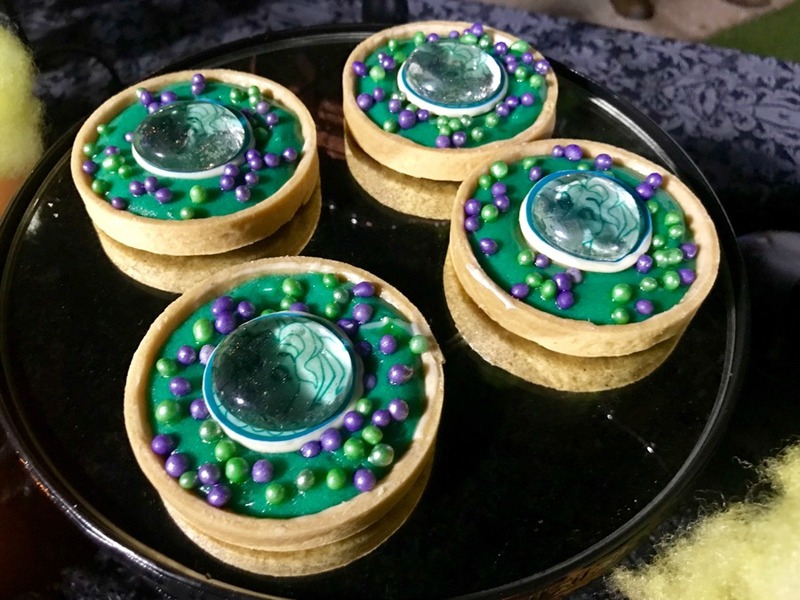 IMPORTANT: To make dining or dessert party reservations that take place during Mickey’s Not-So-Scary Halloween Party, you must have a valid event ticket for that night. 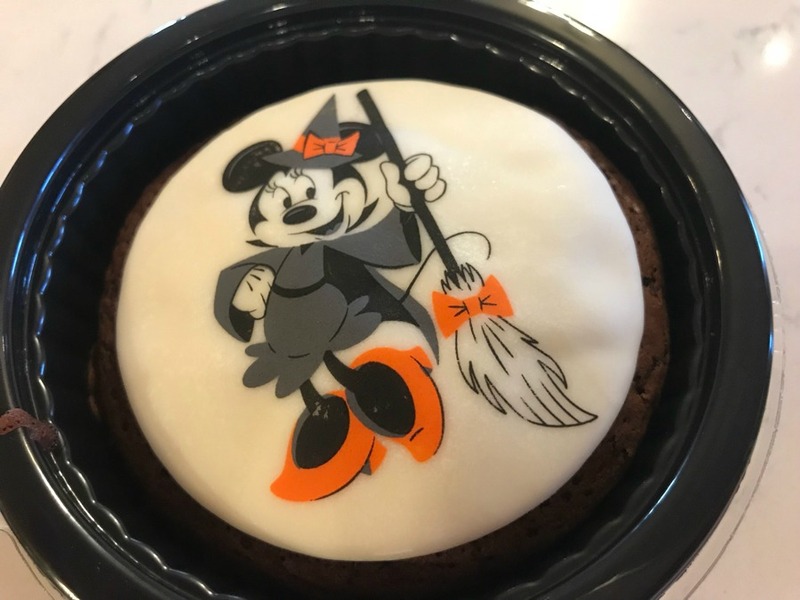 PHOTO TOUR of 2017 Halloween Merchandise at Walt Disney World! 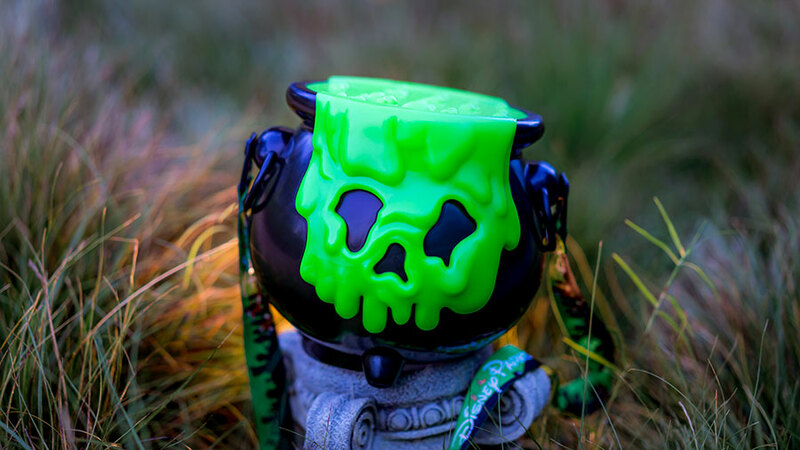 This year, Walt Disney World is offering several Halloween popcorn buckets and seasonal novelties. 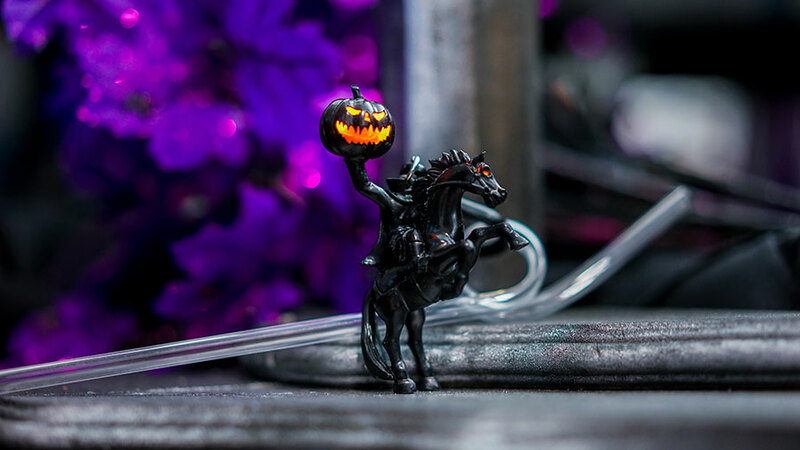 Included is a Cauldron Premium Popcorn Bucket, a Headless Horseman Straw Clip, and a Poison Apple Glow Cube. Additionally, Walt Disney World will have a Happy Halloween 2018 Base Popcorn Bucket, which is refillable bucket you can use for the duration of your vacation. 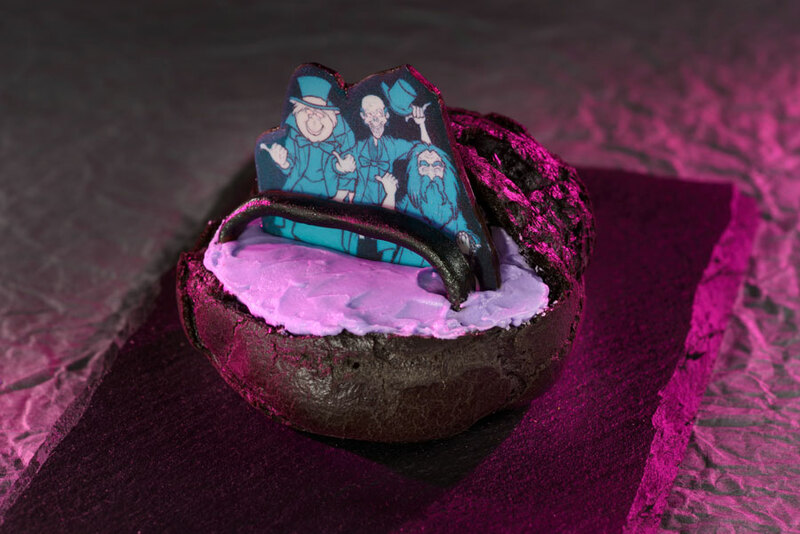 Every year, there are limited-edition pins that are available exclusively to party guests. 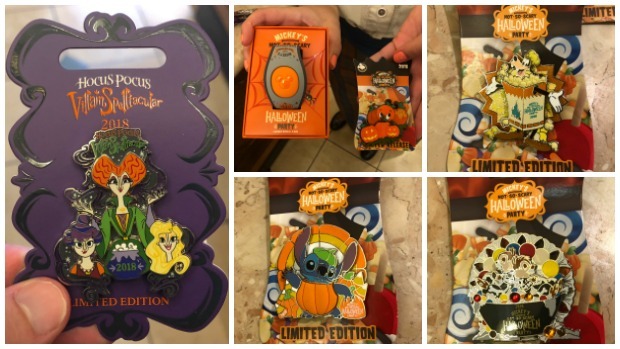 This year, the variety of Halloween-inspired pins includes beloved Disney characters like the Orange Bird, the Sanderson Sisters, Stitch, and more! Pins will be sold until the very last Mickey's Not-So-Scary Halloween Party, or while supplies last. 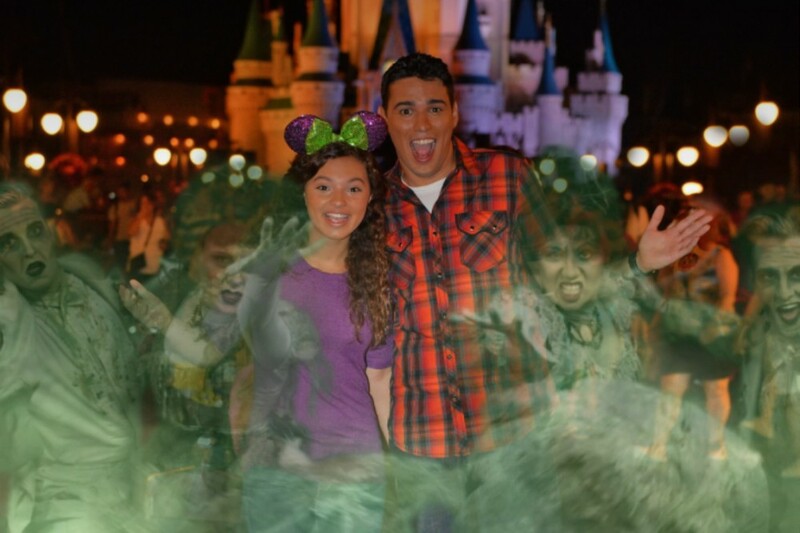 Even the PhotoPass photographers have a ghoulish surprise for partygoers! Guests can get a few different "Magic Shots" taken of themselves! 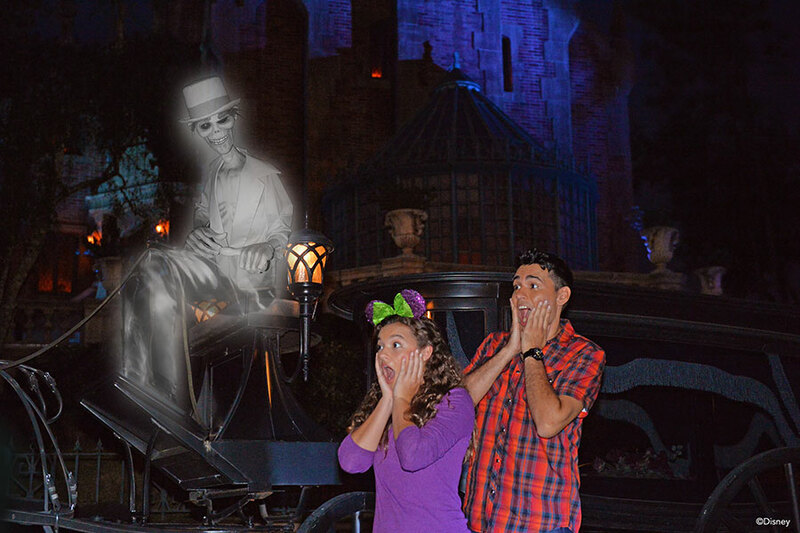 Only available during Mickey's Not-So-Scary Halloween Party, the PhotoPass photographers will pose you with a Grim Grinning Ghost in front of The Haunted Mansion, with the Headless Horseman at the Main Entrance to the park, an Animated Magic Shot in a Pumpkin Patch near the park entrance, and an Animated Magic Shot with a couple of the ghosts in front of the Castle. When you view your photos, the apparitions will appear!